Topics: Vehicle Codes, Fups Testing, Mechanical, & Autocad. Its 3 nameservers are ns3.partnerconsole.net, ns1.partnerconsole.net, & ns2.partnerconsole.net. It is hosted by Netregistry Pty Ltd (New South Wales, Ultimo,) using LiteSpeed web server. 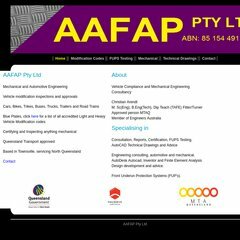 Aafap.com.au's IP address is 202.124.241.203. PING www. (202.124.241.203) 56(84) bytes of data. A ping speed test response, is timed at 192 ms.